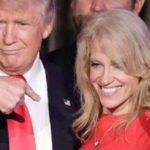 Kellyanne Conway blames Muslim immigrants for “Bowling Green Massacre.” There’s no such thing. Considering that the Donald Trump administration has largely been defined by the fake news that he believes and the fake news that his staff invents, it perhaps shouldn’t come as a surprise that one of his top advisors is now inventing an entire “massacre” on U.S. soil and using it as evidence that Muslim refugees are out of control. Hence, enter Kellyanne Conway the mysterious “Bowling Green Massacre” — which does’t really exist. This new “Bowling Green Massacre” fake news from Kellyanne Conway is so far out of left field that it’s not even immediately clear what she might have been trying to refer it. Instead it appears that she’s merely invented yet another alternative fact to support her nonstop lying on behalf of Donald Trump’s increasingly reckless and fiction-driven policies. And it’s only Thursday.